Caviale Black ADAMAS® There are 13 products. 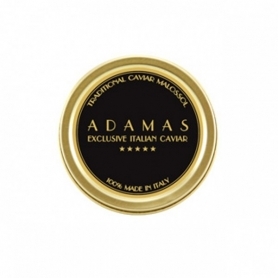 TheCaviar Black ADAMS®is a valuable fresh Italian caviar obtained from sturgeon Siberian sturgeon, worked with the traditional method "malossol".The taste is soft, fine and elegant flavor of pleasant fragrance, sometimes accompanied by a fresh final aromatic note. 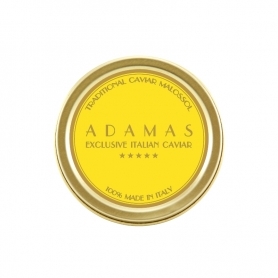 TheCaviar Black ADAMS®is a valuable fresh Italian caviar obtained from sturgeon Siberian sturgeon, worked with the traditional method "malossol". The taste is soft, fine and elegant flavor of pleasant fragrance, sometimes accompanied by a fresh final aromatic note. 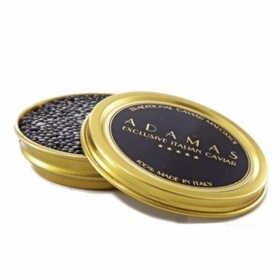 TheCaviar Black ADAMAS®is a fresh hybrid Russian-quality precious caviar obtained from sturgeon Siberian sturgeon, worked with the traditional method "malossol".The taste is soft, fine and elegant flavor of pleasant fragrance, sometimes accompanied by a fresh final aromatic note. The caviar of the sturgeon Asetra (Russian of the Danube) is reputed by the greatest connoisseurs as one of the best caviar thanks to its unmistakable and unique taste. To better appreciate the texture and the taste of this precious caviar, crush the eggs against the palate with the tongue. Fresh caviar processed according to the "Malossol" method from Italian sturgeon eggs - descended from the native Cobice ( Acipenser naccarii ) and the sturgeon Baerii, a Siberian fish but whose breeding has been widespread in our country for many years. Delicate taste and hazelnut notes.